Like most folks I have a love-hate relationship with comic book movies. When they're good they're really good (Christopher Nolan's Batman films, the original Superman films, and Iron Man). And when they're bad they're really bad (Elektra, Catwoman, Fantastic Four films, Ghost Rider, Blade sequels, Jonah Hex, Punisher: War Zone, etc). Most range somewhere in the middle (Superman Returns, 300, the Hulk, the Spiderman, The Watchmen, Tim Burton's Batman films, and the X-Men films). This middle range is where Thor is. Thor is good, not great and that's ok. Plot: The Frost Giants of Jotuneheim, led by Laufey (played through voiceover and cgi by Colm Feore) attempt to conquer the nine realms, starting with earth. The Frost Giants wage their first battle in, you guessed it, the Nordic regions of earth in 965 A.D. The only thing standing in their way is the King of Asgard, Odin (played by Anthony Hopkins, who needs no introduction and can read the phone book and be brilliant). The Asgardians travel to earth through the biofrost bridge (wormhole between worlds) to defeat the Frost Giants and seize their source of power, the Casket of Ancient Winters. Guess that's where all the legends come from. The Asgardians and the Frost Giants return to their respective realms and after a generation has passed, Odin chooses his eldest son, Thor (Chris Hemsworth) to ascend to the throne. Before the coronation can be complete, Asgard is attacked by Frost Giants attempting to reclaim the Casket of Ancient Winters. Impetuous and brash, Thor, convinces his brother Loki (Tom Hiddleston); his friend Sif (Jaimie Alexander); and the warriors three ([Volstagg (Ray Stevenson), Fandral (Joshua Dallas), and Hogun (Tadanobu Asano]), to go to Jotunheim to confront Laufey for an all too brief battle, against Odin's orders. But first they have to pass Heimdall, gatekeeper of the bifrost bridge and watcher of the nine realms (beautifully played by Idris Elba). Note: There was some controversy in the casting of Idris Elba, as he is a Black English actor playing a "Nordic" god. This is easily explained however, as the Asgardians are not Nordic or earthlings for that matter, but they were worshipped by the Nordic people. It appears that the comic book purists had less of a problem with the changes made to Jane's character and with the Japanese actor, Tadanobu Asano, who plays Hogun, than they did with the casting of Idris Elba as Heimdall...who by the way was brilliant. Sounds like cherry picking to me. In my opinion, Heimdall was the most picturesque character in the film. Onward... Disappointed and angry, Odin shows Thor who's still king. Odin strips Thor of his power, banishes him to the earthly realm, and throws Thor's hammer down with him, which becomes embedded in stone. Thankfully, Odin has been doing some light reading on King Arthur. Odin places a spell on the hammer, which allows someone of valor to wield it and "he who removes the 'hammer' from the stone shall become king." 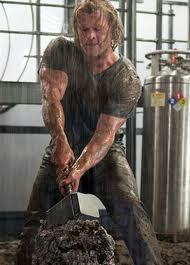 Chris Hemsworth attempting to remove the 'hammer' from the stone. Thor is soon introduced to Jane Foster (Natalie Portman), her mentor Dr. Erik Selvig (Stellan Skarsgard), and their assistant Darcy Lewis (Kat Dennings). 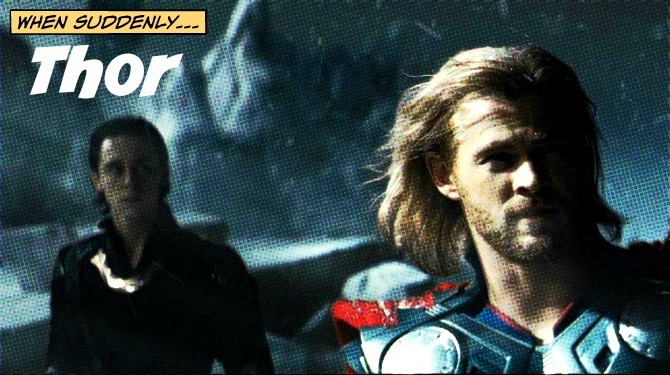 As Thor is mortal, there are plenty of bull-in-china-shop/fish-out-of-water bits. At first it's funny, but it gets old...quick. What little we saw of Asgard, and the other realms, was the best part of the film. The film slows significantly when Thor is sent to New Mexico. After the initial action in Asgard, there isn't much action save the final scenes. As for Jane Foster, what little I know of the comic, Jane Foster is a Lois Lane-type character for Thor, but Jane is no Lois Lane. Jane Foster had a few good lines, but overall this character was poorly written and surprisingly poorly acted. As much as I like Natalie Portman, she was woefully miscast in this film. Part of the problem was the lack of chemistry between Natalie and Chris. Getting back to Jane, instead of a nurse, Jane is written as an astrophysicist, which detracted from the film. They could have turned Jane into a medical doctor, which would have been appropriate for modern times, but the astrophysicist part was a little too convenient. I understand why the writers did it, but they could have just as easily introduced the characters at the hospital. I'm not a purist, especially for Marvel films, but where were the comic book purists on this one? Additionally, the romance between Thor and Jane was rushed and felt like a millisecond. I know this is a comic and everything is implausible, but that's not the point. Good science fiction places real people and realistic interactions in impossible situations. Thor and Jane's whirlwind romance was so fast that the writers forgot to write it. Thor and Jane had very few scenes together, let alone shared dialogue. They must have been going for a "Jane"/Tarzan thing, because after very few Thor/Jane scenes, Stellan Skarsgard tells Thor that he helped him because "of the way Jane looks at him?" What? When? They are quickly in love by the end of the movie? Either there were some integral scenes left on the cutting room floor or Thor had some killer mojo. Chris Hemsworth is a beauty and most of us would be smitten, but they should have allowed the romance to marinate over the course of the next few films. Perhaps if the chemistry between Natalie and Chris were better it would have made up for the dialogue, or lack thereof. Overall, I liked the film. If you take it for what it is, it's a fun popcorn flick, with magnificent art direction, set design, and spectacular costumes. As expected, Kenneth Branagh knows how to make a beautiful movie. However, Thor did not have as much action as the previews suggested and Thor suffers slightly because of this. Thor is a transitional film with the expectation of at least four additional sequels. Thus, this film has the task of introducing all of the characters, including the less interesting human ones. This may be a franchise in which the sequels are better than the original.